Given that we’re a blogging family, (yes, Spectrummy Daddy blogs too, and you can read his side of the story >here<) and I’ve written not one, but two posts about Google, it is only natural that sooner or later our kids would get in on the act. Pudding has learned to google. We’re in the throes of some pretty cool development here in Spectrummy house. Our girl is doing very well at the moment, in lots of different ways. I’ll get around to telling you about it. First things first: googling. I have to say, by the way, I kind of love how I get autocorrected all the time for my British spellings, but the dictionary has no qualms with “googling.” Not bad, Google. I mean, you don’t go around altavistaing, do you? You know what is hard to google? Google. It just brings you back around in circles. Kind of reminds me of conversations with Pudding. Or my own thought processes. Where was I? I was trying to type a post for you the other day, when Pudding came up to the computer and told me, “You want Hello Kitty.” Sometimes it is hard to know if she is inverting her pronouns, or trying some kind of hypnotism on me. I believe either to be equally possible. So I told her that if she wanted Hello Kitty, she’d have to do it herself. She knows how to write the words, but writing is a struggle with her fine motor delays. I thought I’d introduce her to typing as an alternative way of writing words. So she typed “hello” and I showed her that she must press the space bar between words, and then she typed “kitty” and I showed her the return key. And as soon as I let her hit that key, I realized my mistake. Because now she can do it without help. Which means that we’ll have to password protect the computer or reinvent the internet without stuff unsuitable for five year-olds. Yep. Now, because Pudding was already handy with a mouse, she figured out google images, and her newest favourite thing to do is to click through these images describing them as, “Pudding’s Hello Kitty T-Shirt”, or “Pudding’s Hello Kitty toaster.” It would be nice if there wasn’t also Hello Kitty tattoos, cars, and houses. Yes, houses. I guess Pudding’s decided on our next move, and I’m going to assume it is on a whole new continent. I shouldn’t even worry about her struggling with chopsticks, because there are Hello Kitty training ones. 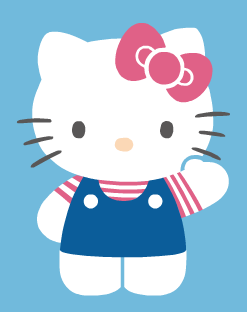 On the bright side, I haven’t yet encountered anything too inappropriate attached to the Sanrio brand. In fact, I even saw Pudding googling other things today, like her school. This is a whole new world that is opening up to her. I just wish we were ready for the one that we’re already living in. Still, if it all gets too much, and I don’t know what to do…I can always google for help. It has worked out for us so far!